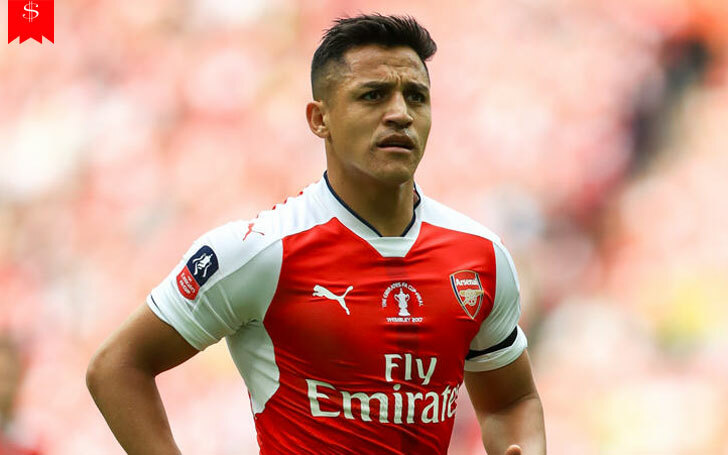 The Chilean professional soccer player Alexis Sanchez, who currently is the striker in the Manchester United, earns around $488,000 per week. Sanchez swapped with the Manchester United's midfielder Henrikh Mkhitaryan signing a four and half year contract last January. Sanchez has made six appearances with his new club. He scored his first goal with Manchester while playing against Huddersfield. He previously played for Arsenal. #Alexis7 - ready for Old Trafford! Well, today in this section, we will talk about the 29-years-old's career and net worth. Further, we will also talk about his relationship with the 28 years old Chilean actress Mayte Rodriguez. The former Arsenal FC star signed an astonishing $250.97 dollar contract walking to Old Trafford for four and a half year. The club pays him $14 million a year after tax making the way towards the highest paid player in Premiere Leauge following the January transfer window. Sanchez' net worth is estimated to be around $45 million in 2018. Sanchez played for the Italian club Udinese before transferring to the Spanish league. He was the most expensive Chile player of all time after his advance to FC Barcelona where he endorsed a $34.86 million three-year agreement. He was also the first Chilean to play for the club. Then in 2014, he wore the 17 number Arsenal jersey after signing a long-term contract with Arsenal following the entry of the Brazilian striker, Neymar to Barcelona. Arsene Wenger signed Sanchez for a deal worth $43.22 million while the high profile Neymar's transfer rate was $67.76 million. Sanchez spent almost four years in Arsenal, the club he loved the most while Wenger was also pretty praiseful towards the Chilean's consistent performance throughout his career with The Gunners. Furthermore, Sanchez is the brand ambassador for the electronics brand Huawei since 2015 and has appeared in an advertisement for Huawei. And he also signed a sponsorship deal with Pepsi back in February 2017. He earns around a million a year only from his endorsements. As Sanchez joined the Red Devils, he was staying at the Lowry Hotel paying $1,137 per night in the neighborhood of the manager, Jose Mourinho. But now, he has already found a permanent resident in Manchester near his new club. The $2.7 million Manchester mansion features five bedrooms, a cinema room, a piano room and three detached car garage along with a private gym. Back in January, Sanchez was spotted with his entourage while he was arriving to check out the Manchester Property driving his $209K Bentley GT. And talking about cars, Sanchez's car collection includes Lamborghini Huracan, $378K-base model and two Audi R8-white and navy blue.